Do you hate trite answers to deep questions? From babyhood we construct mental patterns to help make sense of what is around us. With language we gain (illusory) control of the world. By 3 or 4 we ask questions that begin 'why' as often as with 'what'. Some of the 'why' questions are easily answered, some not. I think one of the tasks of adulthood is to go on asking questions and learn to live with questions with no answers, or no answers yet. This also applies to maturing in faith. Most of the world's religions provide some answer to the difficult questions of life or a way of living with them that gives meaning and purpose. Back in 1999, when on retreat as a deacon about to be ordained priest and feeling inadequate for the changed role ahead, these words from the prophet Micah were given to me. 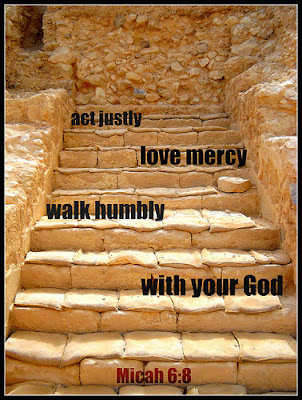 "He has told you, O mortal, what is good;and what does the Lord require of youbut to do justice,and to love kindness,and to walk humbly with your God? " Micah 6:8 These words have remained in my heart and often come back to me, sometimes as re-assurance as they did on that retreat, sometimes as inspiration and challenge. You don't have to be a Christian to take these words seriously and see their implications for faith in action - how to relate to God and one another as human beings. I've been thinking about language that demeans others - so this cartoon caught my eye. One of the things that bugs me is when people refer to adult women as 'girls'. It is usually men who do this and it can seem patronising and belittling. As I wrote this I remembered that I've just renewed my subscription to the '... Old Girls' Association' without batting an eyelid. Well, it is a school for girls and I was a girl when I was a pupil there - but should I start a campaign for a name change for the association? Any WOGA members reading this? 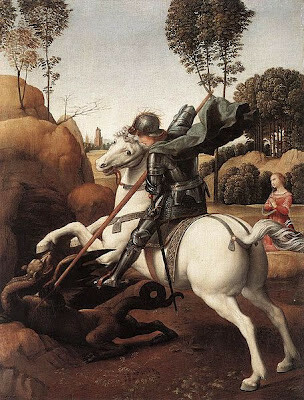 Although I have always lived in England I am apathetic about England's Patron saint St George. The nearest I've got to celebrating St George's Day today is to officiate at a funeral in an English church with a St George flag flying from the tower as is customary. I didn't mention St George and with the amount of rain falling hardly anyone would have noticed the flag either. 'Archdruid Eileen' at The Beaker Folk of Husborne Crawley posted No Doubting Thomas. Kathryn posted one of her sermons Thank God for Thomas on 'Good in Parts. Pam has a reflection in Over to You in Pam's Perambulation. 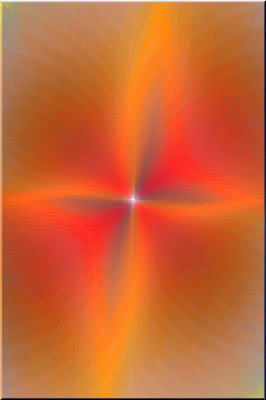 Jan's artwork Easter 2: Living into the Resurrection at the Painted Prayerbook is worth a look. Finally, my post yesterday over on The Big Bible Project, Is Believing: hearing, seeing or doing? Is there anything else to say today? Well, you could wonder what that means, or try it in a few other languages - see Christ is Risen. Or you could read the story of what happened early in the morning of that first Easter Day. Try John 20: 1 - 18 or Mark 16: 1 - 8. Or you could read the page about Jesus' Resurrection on the Christianity website. This sculpture is called 'Reconciliation'. 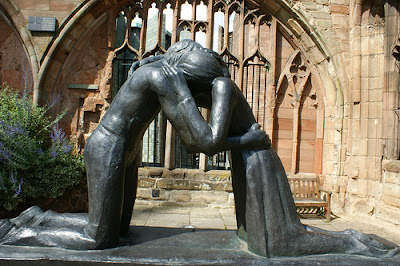 It is in the ruins of the old Coventry Cathedral in England. An identical sculpture is in the peace garden of Hiroshima, Japan. It is by Josefina de Vasconcellos. This is the last of my posts following Christian Aid's 'Count Your Blessings' calendar for Lent 2012. 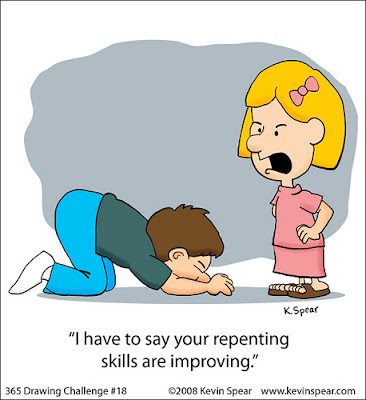 I've found it hard to keep these going as a daily Lent discipline (except on Sundays). I definitely haven't always felt like it, which I think has probably shown in some posts. 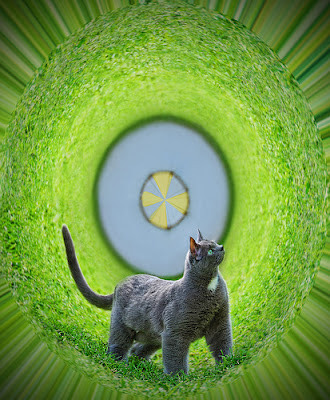 I wondered if it was worth doing. The hardest part was having to forego posting about whatever I happened to feel like writing about. It seemed that every day there was writing I would have preferred to have done. I think it has been worth it, even only in reminding me of the many many ways in which I am blessed - with taken-for granted things like clean water, sanitation, food and education. Here's some quiet meditative music for Good Friday. It's the medieval antiphon 'O Crux Glorioso' (O Cross Glorious) by John Dunstaple (1390 - 1453), sung by the Orlando Consort. The image is a very ancient paleochristian cross that is in the Eremo di S.Croce (Hermitage of the Holy Cross), Castelterminis near Agrigento, Italy. 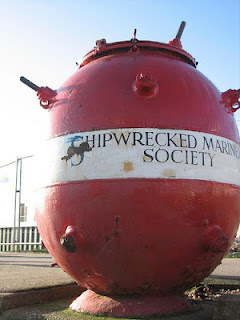 It looks as if the Shipwrecked Mariners Society could do with a new coat of paint for their Brightlingsea old sea mine, now converted to a charity collecting box. "In 2010, 73% of the British population donated to charity. "I don't know how to interpret that percentage figure. It sounds like good news - a majority of people in the UK contributed to charity in 2010. Should we pat ourselves on the back? Or not? How much of that giving was token giving? Or giving in the hope of gaining something, as in a raffle or lottery? What about the 27% who didn't give? Does that mean 27% of the population are too poor? Or too mean? Or what? 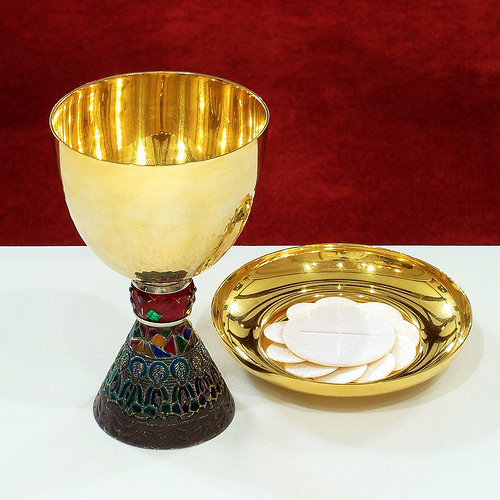 God our Father, you have invited us to share in the supper which your Son gave to his church to proclaim his death until he comes: may he nourish us by his presence, and unite us in his love; who is alive and reigns with you, in the unity of the Holy Spirit, one God, now and for ever. What's the best thing to do? Should you always buy locally grown and in season fruit and vegetables? My gut feeling tells me that's the right thing to do for the sake of the planet. If I buy green beans in winter for example - which I sometimes do - I feel guilty. Should I? 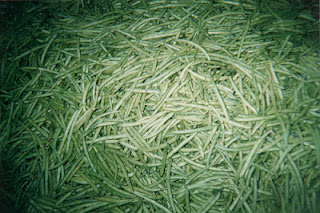 "COC Bless in Egypt has trained farmers to grow green beans for export to Europe, earning them five times the local market price. "If this means that poor farmers can make a living wage I can see that's good in the short term, but what about other unintended consequences of this? I've no time to consider that further today. I'd welcome your comments. A member of my family is in South Africa at the moment, so that country is on my mind. 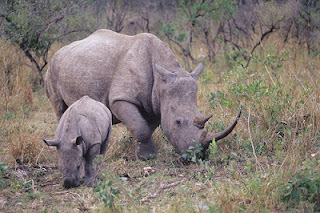 The only connection between this photo, my opening statement and what follows is that these rhinos are South African. "more than a quarter of the working-age population in South Africa are out of work, compared to 8 out of 100 in Britain and Ireland. "I thought the level of unemployment, especially among the young in Britain was worrying but to have 25% of the working-age population unemployed is a frightening and unsustainable situation for any country. Christian Aid suggests giving £1 if you are currently employed. 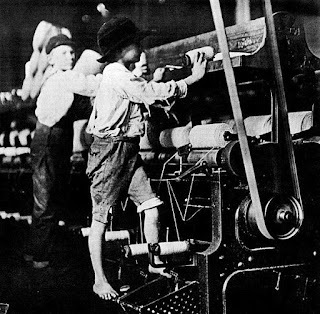 One of my maternal great grandfathers started work in a woollen mill at the age of 9 years. He was lucky in that he was able to attend school 2 hours a day, which for him proved really important. But he also had to put in a daily10 hour shift in the mill 5 days a week with a slightly shorter shift on Saturdays. What's this selection of grubby coins from my purse got to do with anything? It's less than £1 which these days doesn't seem worth much. Well, for a start, imagine this is all the money you had to live on each day. How would you spend it and how would you survive? This is the last week of Christian Aid's 'Count Your Blessings' calendar for this year. I considered not writing about it this week as it is Holy Week. But having posted on the calendar theme every day since Ash Wednesday I want to complete the task. 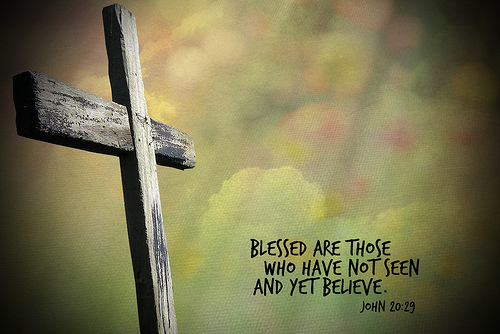 The #cyblessings posts will be brief, to make time to do a Holy Week post each day. "only one in five people in Burundi have more than US$1.25 (80p) to live on a day. "It suggests giving 50p if your salary (or pension) is above 80p a day. Mine is, so that's another 50p for Christian Aid. Soon after I took the photo of the mural I walked in blazing sunshine with a group of pilgrims down the path of the Palm Sunday processional route. It was an ordinary day in October but crowded. Today is Palm Sunday, the start of Holy Week, so it will be even more crowded for the Palm Sunday Procession. Last year there were 15,000 processing, singing, praying and waving palm branches. You can see a video of the 2011 procession below.